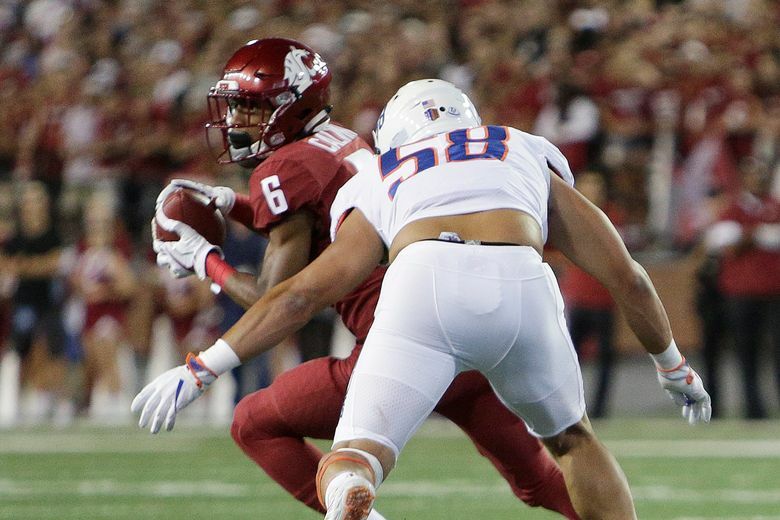 WSU’s defense forced three turnovers and scored on two interception returns, and held the Broncos to two field goals in the first and third overtimes to keep the Cougars in a fight their offense seemed determined to lose. PULLMAN — Washington State’s offense was so putrid for most of the 20th-ranked Cougars’ marathon game against Boise State on Saturday night that Mike Leach called his offense’s performance “pathetic” and said it resembled “one of the most constipated offenses on earth,” in the first half. 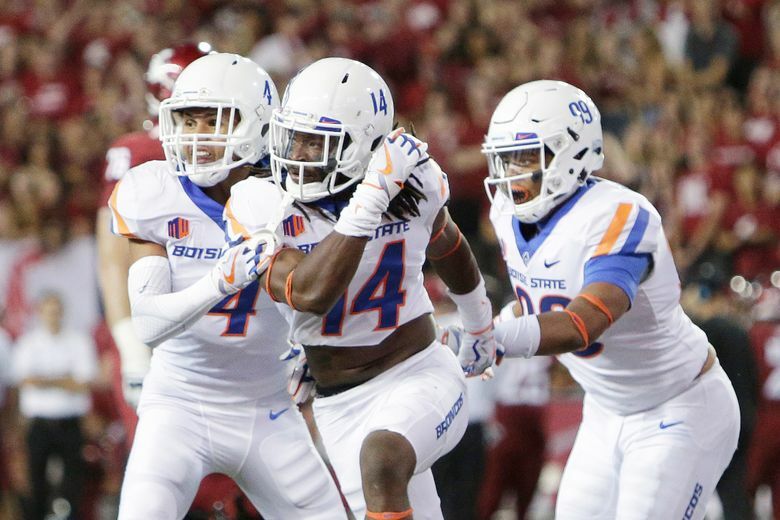 But on this bizarre night, the WSU defense was every bit as good as its offense was bad, and it was on the strength of this defense that WSU (2-0) somehow found a way to rally from a 21-point fourth-quarter deficit to beat Boise State 47-44 in triple overtime. WSU defensive coordinator Alex Grinch’s Speed D forced four turnovers and scored on a fumble recovery and an interception return, and held the Broncos (1-1) to two field goals in the first and third overtimes to keep the Cougars in a fight their offense at times seemed determined to lose. 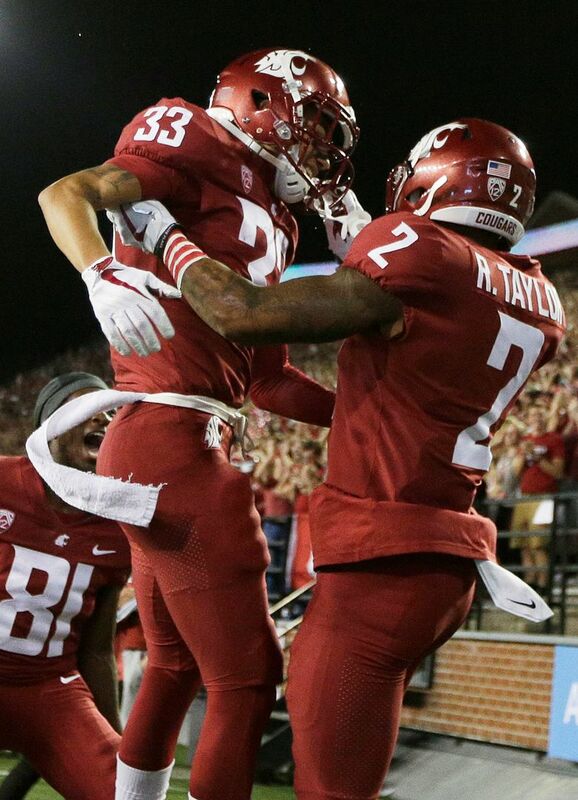 Win they finally did, though, in triple overtime, behind backup quarterback Tyler Hilinski, who entered early in the fourth quarter in place of an injured Luke Falk and played the game of his life. Hilinski finished 25 of 33 passing for 240 with three touchdowns. That third touchdown was the magical game-winner — a short pass to running back Jamal Morrow from the 22-yard line. 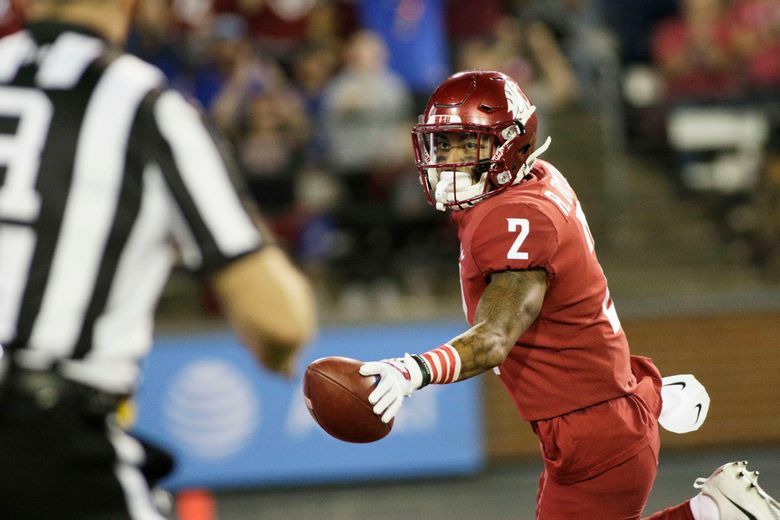 Hilinski hit Jamal Morrow on a swing pass touchdown on second-and-7 to cap a miraculous 21-point fourth quarter rally that gave the Cougars their first-ever triple overtime win. Morrow scooted up field, evaded a defender, then, three yards out from the goal line, upended himself to avoid a second onrushing Bronco. The whole time, all Morrow could think about was that he had to get past the 1-yard-line that had stymied the Cougars twice in the first overtime period and forced them to settle for a field goal. “I wasn’t going to waste that opportunity two times,” Morrow said. So Morrow went up-and-over and into the end zone, stretching the ball out over the goal line while making sure to keep a firm grip on it. Of course, just to prolong the anxiety of the 32,631 fans at Martin Stadium, the play was reviewed. Luckily for the Cougars, it stood up as a score to complete their crazy comeback. By the time the touchdown was confirmed, the students were vaulting the railings and surging onto the field in euphoric elation as they mobbed the team and celebrated WSU’s miraculous victory. Even Leach, as annoyed as he was by his offense’s lackluster first half, couldn’t help but get caught up in the excitement after the game. Hilinski sparked the Cougars to two fourth-quarter touchdowns that rallied them from a 31-10 deficit to send the game into overtime. Then, in overtime, Hilinski managed to get the offense within a yard of the goal line. But, as had been the case all night long, the Cougars could not finish. James Williams was stopped a yard shy of the end zone, Morrow was stymied for no gain, and on third-and-goal, Isaiah Johnson-Mack dropped a pass that hit him in the chest in the end zone. The Cougars settled for a 22-yard Erik Powell field goal. The Cougars put their defense on the field first in the initial overtime period, and just as it had all night, Grinch’s squad came through. 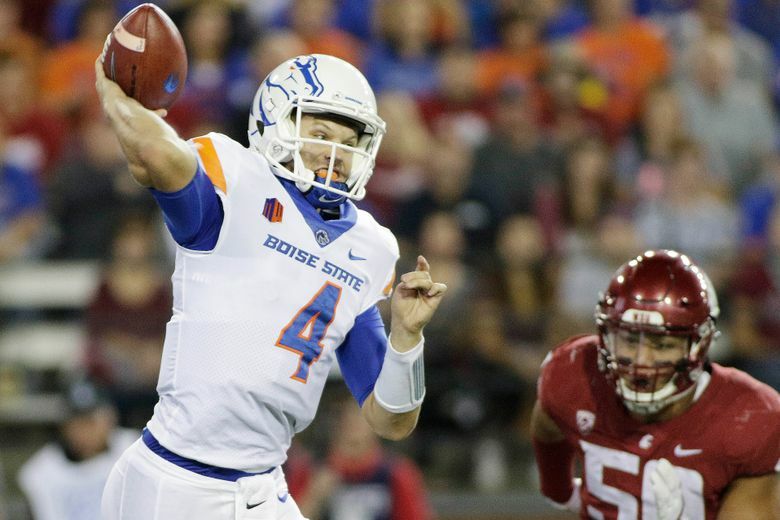 Peyton Pelluer, who scored the momentum-swinging pick-six in the fourth quarter, had two huge stops, and Derek Moore harassed Boise State quarterback Montell Cozart into throwing the ball away on third-and-9 to force the Broncos to settle for a 29-yard field goal. 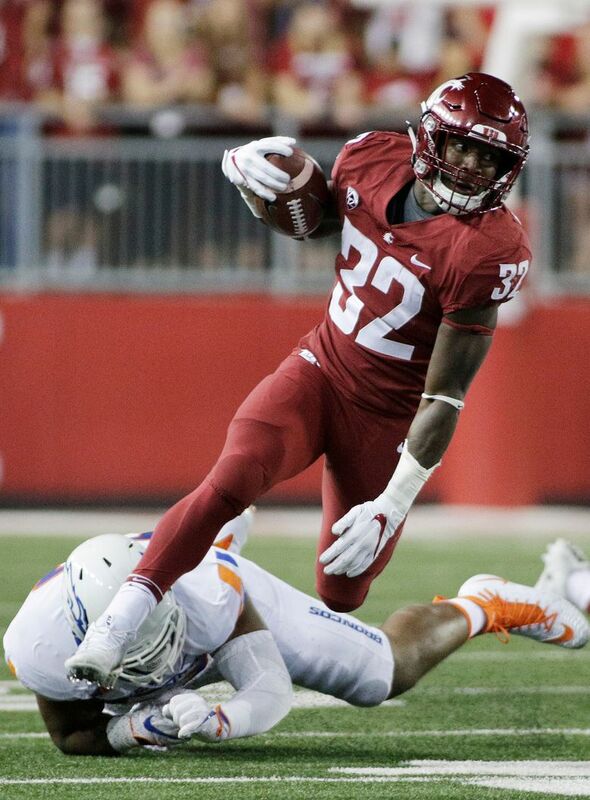 In the second overtime, WSU struck first, scoring on a 1-yard run from Gerard Wicks — his first carry of the evening — but the Broncos refused to concede, and Cozart connected with Cedrick Wilson for a 15-yard touchdown. 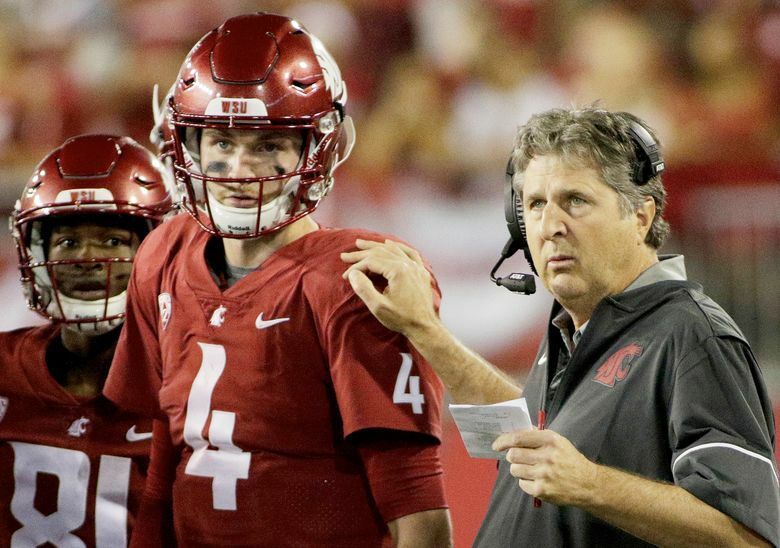 In a weird twist, on a night when Falk set WSU career records for passing yards and offensive yards, he also struggled enough that he was benched for Hilinski for one series in the third quarter because he couldn’t get any offensive rhythm going. Hilinski played one full series, then Falk re-entered the game only to get knocked out of the action entirely after he took a hard hit from Boise State’s Jabril Frazier early in the fourth quarter. “I wanted him to see how easy it would be out there. And then he got jacked up,” Leach said, “Sometimes just an extra set of eyes as it slows down fro the sideline will kind of clarify things for you, which I think it did (for Falk). But then of course Hilinski had the hot hand at the end and we were being cautious (with Falk) and (Hilinski) played well. Falk finished 24 of 34 for a career-low 193 yards and an interception, and was held without a touchdown for the first time since WSU’s win against UCLA last October. 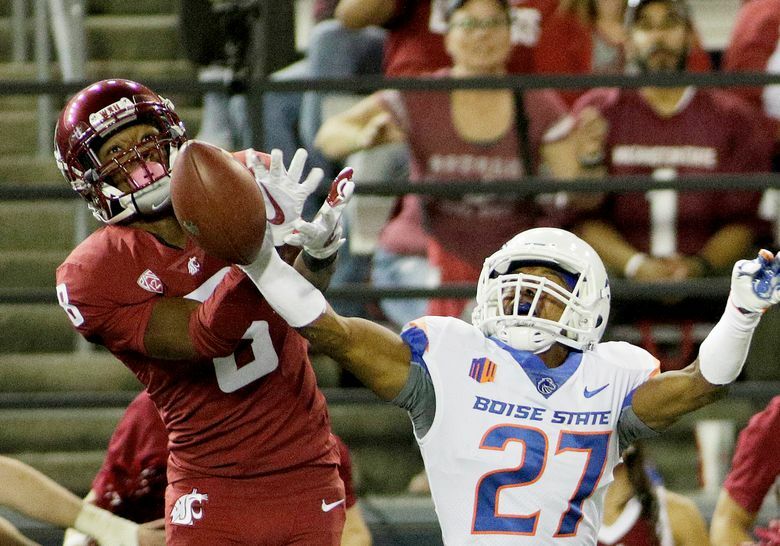 Freshman Renard Bell led WSU’s receivers with 107 yards on seven receptions. Morrow finished with six catches for 36 yards and two touchdowns. 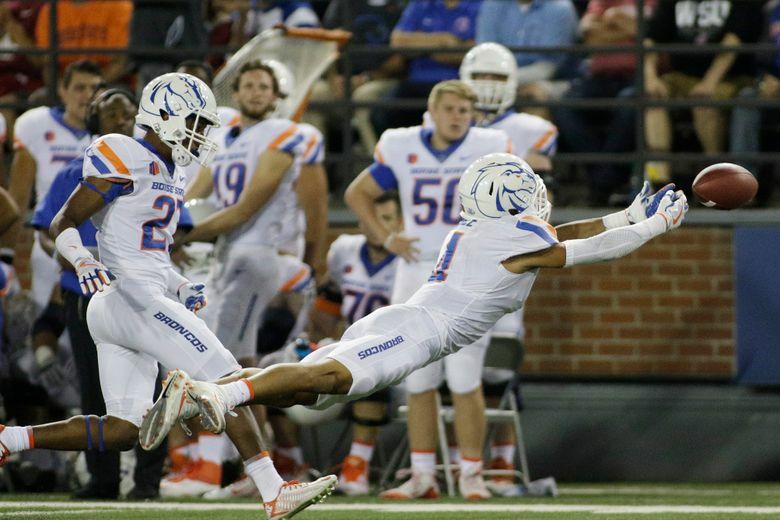 Cedrick Wilson had a monster game for Boise State, recording nine catches for 147 yards and two scores.